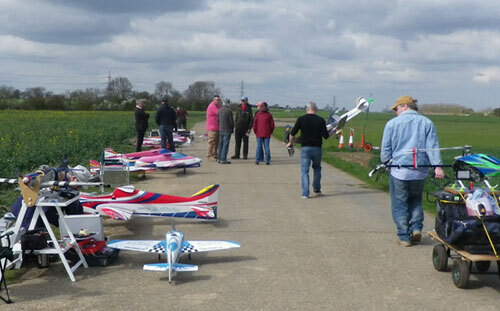 Stansted Model Flying Club welcomes members of all ages and ability. Our primary aim is to have a relaxed atmosphere for our members whilst promoting safety at all times. Stansted and District Model Flying Club is based just a few miles north of Saffron Walden (South of Cambridge) on a disused aerodrome with very easy access from the M11 and A11. We are a very active and friendly club that flies all year round. Flying times are 10am till sunset or 8pm, whichever comes first. The site is to be vacated no later than 8:30pm and we fly every day apart from Tuesdays and Thursdays. Our Model flying site is well cared for; we’ve recently invested in improving the grass surface, and continue to maintain it to a high standard through regular mowing and treatment. The pits and car parking is situated on a hard surface that surrounds the flying site, enabling flying to take place throughout winter without a risk of getting covered in mud. There are very few restrictions and all types of model aircraft are flown, including but not limited to helicopters, scale and aerobatic aircraft. All of which get along very well together in a flying environment free from obstacles or high terrain. There’s free training for beginners and improvers available all year round, with several club examiners at the field most weekends and during the week to lend a helping hand. We hold monthly club meetings on the first Monday of the month from October to May at Ugley Village Hall where we have we have occasional raffles, talks and model demonstrations. These meetings are a great for anyone interested in getting into Model Flying to come along for a cup of tea and a friendly chat. Meetings during summer months (Jun -Sept) take place at the patch to make the most of the weather! More details on meetings and events can be found on our “Events” page.